Many kinds of applications need to browse files in the file system. For example most programmers text editors (I&apos;m writing this in Microsoft Visual Studio Code) include a sidebar showing the file-system. Therefore it&apos;s important to have such a component to use in Electron/Vue.js applications. In this article we&apos;ll look at one way to implement such a component. All set. Welcome to your new electron-vue project! The workspace at simulatedgreg/electron-vue includes a very useful framework for developing Electron applications using Vue.js. This downloads the skeleton anc creates the named directory. I&apos;ve configured it to use vue-electron and vue-router but not the other components, and to not include any ESLint or unit testing features. You may find it useful to answer these questions differently. The framework includes support for both electron-builder and electron-packager and I&apos;ve chosen the former. The last step is somewhat not-useful at the moment because we&apos;ve done no configuration. Let&apos;s start the surgery on the skeleton application. We&apos;ll make a few select changes in main.js to tweak how the application launches. Change the imports as shown. The idea is to "walk" a selected directory tree, sending out information about the files in that tree. Since this is a test application there are some hard-coded values. For a real application we&apos;d have a file browser dialog to select a directory. The walkdir module ( https://www.npmjs.com/package/walkdir) "Walks a directory tree emitting events based on what it finds." As it traverses the directory tree it emits events concerning what it finds. We simply forward those events to the Renderer process. The fn argument is the complete pathname that is found. On studying this application it seems more useful to send not the complete pathname, but the segment following the root directory being scanned. Therefore we use the slice function to trim the string appropriately. This message can be sent from the Renderer process to cause the Main process to rescan the directory structure. Some of this carries over from the skeleton, and the rest initializes support for some of the dependencies we loaded, as well as useful objects. We initialize Buefy (the UI toolkit), sl-tree-vue (the tree viewer), and vue-awesome (Font Awesome). The messageBus object is an extra Vue instance we&apos;ll use for sending messages around the application. Vue.js has great support for a child component to send messages to its parent component. But out of the box it does not directly support sending messages between any two components. We will use messageBus to do so - since all Vue instances contain capabilities to emit and listen to messages. We see two such messages - the file and directory events are received from the Main process, and then are emitted on the messageBus. What we&apos;ve done so far is position this component as the main window of the application. We&apos;ll implement it as a single-file-template that will in turn demonstrate using a file-system oriented tree browser. In src/renderer/components delete all the supplied files. Those files comprise the demo application, and we need none of that code. In the <template> we have a simple Buefy columns component. In the left-side column is the file browser, and the right side is an area to display information. The right side also includes a button to cause rescanning of the directory content. The Rescan button causes a message to be sent to the Main process. If you refer back to the Main process you see this message causes the chosen directory to be scanned. When the chosen directory is scanned a series of messages are sent here from the Main process. Those messages are either file or directory events, and contain both a pathname and the stat object corresponding to the file. Those messages are handled in event handlers, and turn into addPathToTree calls which add the pathname to the tree object. We&apos;ll get to that a little later. Vue.js makes sure the $refs object has fields corresponding to every component with a ref= attribute. This component is documented a little further into the article. In this demo application each prints information in the information pane. This line of code instructs the file tree component to dismiss the menu. We&apos;ve mentioned this component several times, and now it is time to investigate it. The repository for the component has a whole build configuration and other scripts. See https://github.com/robogeek/vue-file-tree for details. In this article we&apos;ll only investigate the .vue file. To use this component in your application add the following to the dependencies section of the package.json in your application: "vue-file-tree": "github:robogeek/vue-file-tree",. Then follow the further directions in the README, or work it out from the code presented earlier. There are a number of event handlers and other configuration we&apos;ve implemented to configure default behavior that makes sense as a tree component displaying files in the file system. toggle This determines which arrow button to show for directory nodes which are expanded, versus ones which are closed. title This describes one row of the tree component. We want to show an icon based on the file type. We have a means to select these codes to select the correct icon. sidebar This describes an icon that appears at the far-right of the tree display. We also have a slot of our own, context-menu, which is where the context menu HTML arrives. In this case we are using a Buefy menu component. The display of this component is controlled by the contextMenuIsVisible data item. Obviously we are using the Font Awesome icon set. * Close dropdown if clicked outside. // then we should ignore this. At the top of this we import various required modules. This includes the sl-vue-tree component, and some of the Font Awesome icons. Both of those become Vue.js components available to this component. The sl-vue-tree component expects data items in a particular data structure. When in Bucharest do as the Romanians, so therefore we must give a correct data structure to that component. An example of the data structure is in a comment shown here. The addPathToTree function receives the file and directory messages described earlier. It receives a simple pathname string plus a Stat object. The task here is to convert that information into the structure required by sl-vue-tree. I ran into a problem developing this component. The requirement to create that directory structure is to split the pathname string into segments. To do this in a operating system independent manner requires careful considerations. At first the path-directories module (https://github.com/jy95/path-directories) was used. It takes a pathname and reliably splits it into segments accounting for Windows or POSIX file path conventions. 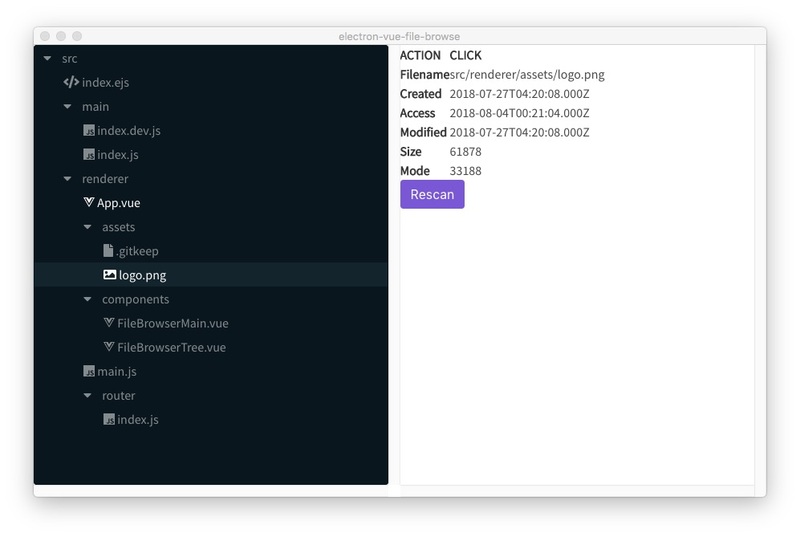 Unfortunately as written it runs on Node.js just fine, but this vue-file-tree component is packaged assuming it is running in a web browser. Where path-directories assumes a path module compatible with Node.js, the packaged Vue.js component receives a path module which presents a subset of Node.js functionality. This module handles pathname normalization and robustly splitting the path irregardless of file system conventions. It returns the object supplied by the path.parse function, augmented with a dirs attribute containing the directory portion of the pathname but split into an array. What addPathToTree does with this is to add each segment of the file pathname into the data structure required by sl-vue-tree. Then Vue.js arranges for this structure to be handed to sl-vue-tree which causes the file system tree to diaplay. The other methods handle various events going back and forth. The framework supports hot reload while the app is running in dev mode. This is what the application looks like during execution.